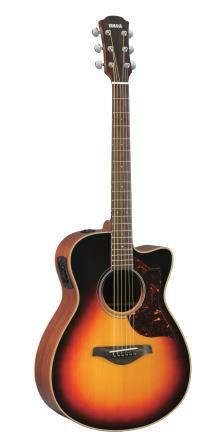 Yamaha are well known for producing high quality guitars at an affordable price. 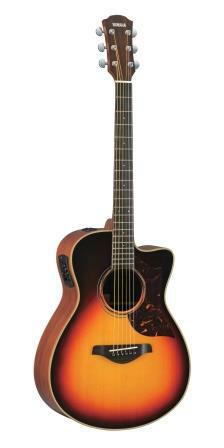 The Yamaha A Series acoustic guitars are no exception but they do fall into the higher end of guitars compared to a lot of their other models (perhaps only the L series are on the same level). Even so, the lower end of this range is still really affordable and the mid level offers amazing value for money, in my opinion. The prices in the A Series range from the lower end of $815 (USD MSRP) to $2,399 (USD MSRP) for the top guitars in the series. Actual prices will be less. I have estimated actual prices at the end of the post. Below are the guitars that make up the A Series line-up. We’ll take a look at each individually in a moment. They’ve used some very short and simple names there – like it! All guitars in the series have cutaways and in-built electronics. O.k. let’s look at each guitar in the series. The first guitar in the series that we will look at is the A1M. This is the lowest priced model in the line-up and the main reason for that is that it has laminate wood back and sides. My biggest disappointment with this guitar is the plastic nut and saddle. If you bought this guitar, replace the saddle and the bridge pins – it’s really easy to do and should add some sustain and clarity to your sound. That said, they still sound good but it would be an extra improvement. The 2nd dreadnought model for the A1 part of the A series is the A1R. The only difference between the A1M and the A1R is that the A1R has laminate rosewood back and sides instead of the laminate mahogany back and sides that you’ll find on the A1M. There isn’t a huge difference between the two in terms of sound. But the laminate rosewood will bring out the highs and lows more and the laminate mahogany will be more mid-range heavy. The choice may also come down to which you like the look of better – and, if you prefer the look and sound of the A1R, whether or not you’re willing to pay extra for it. Though in reality the difference in price won’t be as large for the actual price. Guitars are rarely sold at their MSRP – it’s usually a good bit lower. I will show more realistic prices that you should expect to pay at the end of this post. The AC1M is essentially the A1M except in the Concert body size. Even thought the shape/size is the only difference, it will have a significant impact on the sound. The concert model has a smaller body and a different shape – with a narrower waist. This will produce a less boomy and bassy sound than the dreadnought. It will be a sound more balanced across the spectrum. The AC1M is available in Natural and Sunburst. The AC1R is essentially the AC1M except with Laminate Rosewood back and sides in place of the Mahogany back and sides. Said another way, this is the concert model of the A1R. Again, the choice between this and the AC1M is mostly down to what you prefer the sound of – and if you prefer the sound and look of the AC1R, then you’ll have to decide if it’s worth the extra money. The AC1R is available in a Natural finish, a Black Finish and a Sunburst finish. See bottom of this post for prices that you should expect to actually pay (the MSRP is seldom the same as the actual retail price with guitars). O.k. now let’s take a look at the first of the next level up in the series – the A3M. The A3 series guitars offer a step up in quality from the A1 guitars – with that comes a step up in price, but not a massive one, to be fair. The first thing that you’ll notice is different in the A3M over the A1M, is that this guitar is all solid wood. It has Solid Mahogany back and sides in place of the Laminate Mahogany on the A1M. This is the most significant difference and will make a significant difference to the sound. This is also what largely causes the increase in cost – but justifiably so, and to be fair the price jump isn’t that much considering you’re going from laminate to solid wood back and sides. There are plenty of series of acoustic guitars where the price jump between the two would be larger. The System 63 Analog pre-amp: This is the next step up from the 66. It’s a more complex system that better replicates the true sound of the unplugged guitar (IMO). This is the next most significant difference after the solid wood back and sides. Given the upgrade in electronics and the upgrade to solid wood back and sides, the A3 series are the best value for money of the series – there really isn’t a big hike in price at all for some really significant upgrades. As you can probably guess, the A3R is essentially the same as the A3M except for one difference, the back and sides are Solid Rosewood. This difference is however, actually a reasonably significant one. The solid rosewood will help to produce a noticeably different tone than the Mahogany back and sides. Not necessarily a better one – what you prefer between Mahogany and Rosewood in a personal preference. The Rosewood back and sides will produce a brighter tone with more pronounced highs and more clarity in the bass and more complex overtones. The Mahogany back and sides will help to produce a warmer tone that is more mid-range heavy and with more subtle overtones. As they both have solid Sitka Spruce tops, these differences will be noticeable but subtle – and the top wood has more effect on tone than the back and sides. Even though the sound from Rosewood back and sides isn’t necessarily “better” rosewood is a more expensive wood and that makes the price higher. Though, again, it’s not significantly higher. AC3M Sunburst. Also available in Natural. The A3 models also come in the concert size. The first of which is the AC3M. This is essentially the A3M, except in the concert body size/shape. If the sound and feel of the concert size is what you are after (and you want the Mahogany back and sides) then this is the model to go for. And the last of the A3 models is the AC3R. This is basically the A3R except in the concert body shape/size. Or said another way, it’s the AC3M except with Solid Rosewood back and sides. Again the choice between this and the AC3M, is the same as the choice between the A3M and A3R – which do you prefer the sound of – Rosewood back and sides or Mahogany back and sides. Finally we come to the A6 models, starting with the A6R. The A6 models are only available with Solid Rosewood back and sides so there are only 2 different guitars here. The A6 guitars are the top of the line of the A series and feature a few upgrades from the A3 models. Case: Comes with a hard-shell case. So there are a number of differences here, but none too significant – but all the small differences add up. Bone nut and saddle and ebony bridge pins – this is the most significant difference for me. I’d like to see this on their other guitars too though. This is something you can change if you bought one of the A1 or A3 models but it’s nice that you get it as standard in the A6 models. Gold tuners (open gear) in place of Die-Case chrome tuners on the A1 and A3 models. Nitrocellulose Lacquer finish on the top – as opposed to the gloss finish on the A1 and A3 models. Don’t really know what this means or what difference it makes but if anyone knows this leave a comment in the comments section at the end of this post. This is no doubt the cream of the A series crop. But you’ll have to decide whether it’s worth the extra cost over the A3 models. Could you buy the A3R, replace the nut, saddle and bridge pins, buy a case and essentially have an almost as good guitar for less money? Possibly. I imagine it’s close. Of course if you want the Solid Mahogany back and sides then the A3M and AC3M are the only options. The final guitar in the A Series is the AC6R. As you can guess this is the concert shape/sized version of the A6R. So you get all the upgrades as you do with the A6R but in the concert shape. Both the A6R and the AC6R are only available in a natural finish. As promised, here are roughly the actual prices you would expect to pay (the MSRP is practically always more than the actual price when it comes to guitars). Prices still in USD. When you look at it like that, these guitars are really affordable for what you are getting. In my opinion the A3 series is the way to go if you’re looking for value for money. For only $100 more than their A1 counterparts, you get solid back and sides and improved electronics. I would change out the saddle and bridge pins personally, but these still represent awesome value for money, in my opinion. If you’ve got more to spend then you could look at the A6R or AC6R. Though if you want Mahogany back and sides then the A6 series doesn’t accommodate that. Also the A6R might be more difficult to get your hands on as they don’t make many – they are limited edition models. 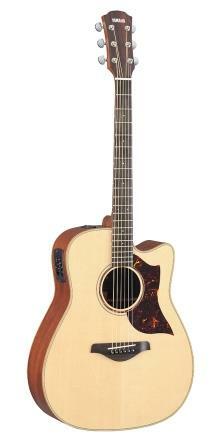 I hope you’ve learned more about Yamaha’s A Series acoustic guitars in this post. If you have any questions or if there’s anything you want to add, feel free to leave a comment in the comments section below and I’ll reply as soon as I can.